Weddings are the most memorable day of your life. All the thought and time spent should make the day absolutely perfect, right? Not always. It's a major bummer when the centerpiece of the entire day, your wedding cake, is a thing of nightmares during your dream wedding. It can actually be downright haunting. How is this cake even standing? You've got to give props to the baker because they honestly defied gravity (I think?). It almost looks like they bought a bunch of mini cakes and just threw them on top of each other hoping everything would just work out or something. How do you even cut into this menagerie? You don't have to be a psychic to see this cake likely leads to disaster come serving time. Ah yes, weddings are full of hopes and dreams, but finding a good wedding cake can be just as hard as stumbling on a unicorn sometimes. Speaking of which, a good tip is to just keep this mystical creature far, far away from your wedding cake. Besides, this silly cake can only feed maybe four people? Why would anyone think this is a fantastic idea? Keep those unicorns in your dreams…not in your dream wedding. Is anyone else thinking hockey mask here? Wait, perhaps this horrendous cake was Freddy Krueger's dessert table during his "I dos." No, maybe both the bride and the groom are secretly serial killers and are giving the world a warning about the carnage they are about to ensue together. Then again, maybe they're both already part of the afterworld, and they are having a ghost wedding. Either way, this is a cake that would make Jack Skellington proud…and that's about it. 4. 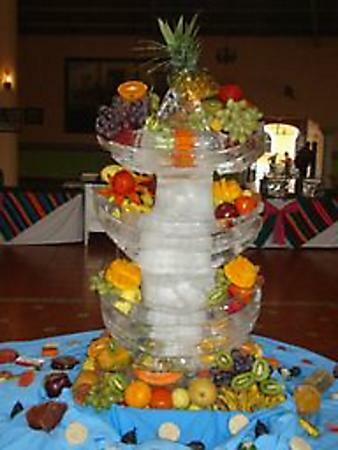 Fruit in Ice "Cake"
First of all, why? Sure, wedding cakes can be overwhelmingly expensive, but your budget should seriously be able to cover more than the produce aisle at Ralphs can offer. Do they honestly think they are slick by stacking up a few bowls to take on the shape of a cake? The guests were probably livid…if they didn't keel over from laughter first. Whoa! Someone grab a stake to hold this sloppy cake in place! Just kidding, this cake was actually made to look like a complete disaster for some reason. Not sure why anyone would want to put themselves into cardiac arrest ensuring their cake is still alive and well during cutting time at their wedding…but to each their own! At least they took the time to put some elegant stargazers on it. Confusion is the word to best describe this cake. First of all, what on God's green earth is this poor cake supposed to even be? Yes, we get you like horses, but why are there two horseshoe cakes coming off of this ghastly thing? And those colors…no. The clashing is enough to temporarily blind any unfortunate onlooker. Lastly, stairs? This looks like one of those "worst of the '80s" type of situations. Big time fail. Pause to pick your jaw up off the ground. Yeah, this is a real…cake…. and there are slices of pie on the top for some unknown reason. Pie is great and everything; heck, so is cake, but combining the two is sacrilegious! For shame! Also, are those things birds? They could be seals with wings in all honesty. Maybe lizards. There are so many unanswered questions that come along with this mess of a cake-answers we'll never know. "A" for effort. "F" for execution. The problem isn't the craftsmanship, it's the complete lack of organization or theme. Why the heck would a cake have bells, grapes, bows, a multi-colored disco ball (??? ), and suddenly change from color to color? It's almost like there were three separate cakes smashed together. "Sure, we can just stack absolutely everything on here, why not?" was likely the response. But sometimes, less is seriously more. 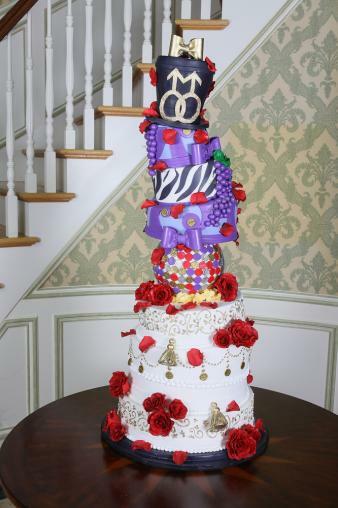 Ok, this odd cake obviously symbolizes the entrapment marriage offers…for two different couple. Oh! Also, they all have a drinking problem, so they are confined within the suffocation of alcoholism! Yes! Nailed it! But seriously, what is going on here? Not only that but that frosting. It's almost as mesmerizing as those Magic Books where you stare at some zany picture waiting for some random image to appear. If we stare long enough, maybe the cake will tell us what the heck is going on with this design work. Of all the Star Wars characters available, why would you choose the one that looks like a giant turd when turned into a cake? At least the couple looks happy, but would you, as a guest, be stoked to get a slice of cake that's already been digested? No. Besides, isn't your wedding day a day full of happiness and excitement to take your first steps into a lifelong, trusting marriage? Jabba was the last one to be into any of those things! He was a real jerk, actually! Yoda says, "A fail this cake is." Although your wedding is your special day, your cake should be on point and make your guests want to eat it. 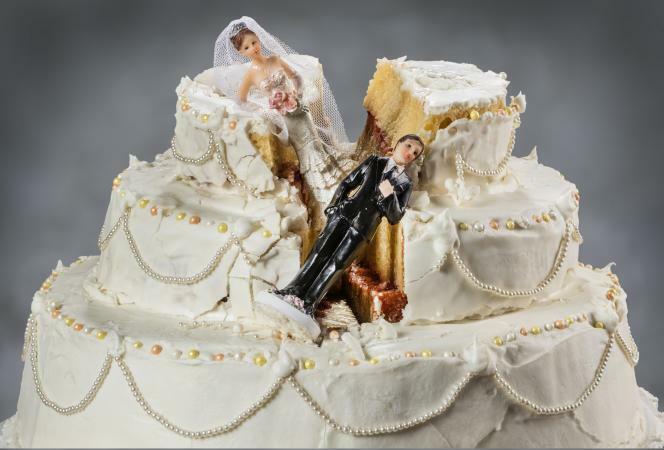 Shelling out a few extra bucks isn't what anyone really wants to do, but you don't want to go down in history as the couple that epically failed with their wedding cake. Take the time to think, "What would I say if I saw these cakes at someone's wedding?" Then, just say no if your face cringes.